A customer needs to conduct a rotor blade fatigue test, the normal signal is something like a sine waveform swing between 100 and 300 (real number is not used here to protect their IP), when the blade begins to show fatigue, the sine waveform will swing around a lower base line, say between 98 and 260, and at this point, the test must be stopped to prevent damage. To do that, they decide to monitor the mean value of the waveform over several cycles to determine when the test should be ended. First they establish the minimum acceptable level of the mean value using Magic Meter, which will be 200 if we use the numbers above, then equation (#min0+#max0)<0.95*200 is used to set the digital output to high, which in turn will trigger the switch to shut down the fatigue test. SMS/Emal alert system: The manager in charged of EOC production line needs to be informed when the temperature of his machine gets too high, but he can't stay around the line all the time, and all he has was a old flip phone. "Can your addon send me text when such alarm happens?" he contacted us. "No problem! ", with Digital and Alarm Output, running along with WinDaq and his DI-718, the problem is solved! Push the button D0...D7 to access the logical equation for the corresponding digital output. Push the button to access the logical equation for the SMS/Email alert. The second parameter is the hold-off time (in seconds) for the next alarm email once an alarm is triggered. Enter 0 to disable the hold-off feature. Slides has three states. It controls the state of a corresponding output. For SMS/Email alert, TRUE generate periodical report if report interval is greater than 0. FALSE stops any SMS/Email alert. The numbers are Microsoft Virtual Key codes. 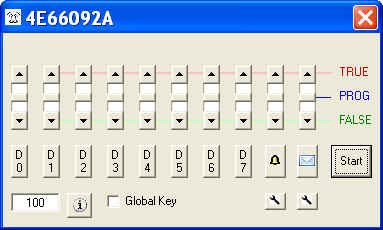 The HKey0 and HKey1 are the two hot keys to mark the commands, which are Ctrl and Shift by default. For example, if you have two 720s, assign 17 to HKey0 and HKey1 for the first WinDaq device, and 18 to HKey0 and HKey1 for the second WinDaq device. Thus, instead of using Alt+Ctrl, one can use Ctrl+QWERTYUI to set the digital output to high on device one, and Alt+QWERTYUI to set the digital output to high on device two..
Support non-English (United States) Regional and Language options. To use the data-window derived results, use #min, #max, #ave, #rms and #acrms to represent Min/Max/Ave/RMS/ACRMS in the expression, i.e, #acrms0 take the AC_RMS of channel 0. To access all digital inputs, use #digx0. Note, digital input must be enabled in Windaq's channel list. Keep Alive email's interval is stored in c:\windows\ultimaalarm.ini, under the key of EmailAlarmInterval. The default interval is 20 seconds, to remove Keep Alive, please change this number to 0. DI-720 P/EN can have more than 8 digital inputs/outputs under certain non-standard configuration. We don't support them in this standard add-on. .
Not every data point is tested against the trigger condition. The add-on is paced by Windows' timer, up to 50Hz.